Setup: the local Walmart just replaced all their cart corrals. As nearly as I can tell, the installers permuted the railings; a simple three bit rotate-left-by-one operation would fix it. Not much to my surprise, every single corral looks like that; either the instructions were wrong or, more likely, the installers never read the instructions. Obviously, they didn’t think about the results and nobody ever checked the final result. This entry was posted on 2014-04-19, 07:41 and is filed under Oddities. You can follow any responses to this entry through RSS 2.0. Both comments and pings are currently closed. The corrals at our local Walmart are assembled correctly, which evidently, for psychological reasons, discourages the locals using them. Some years ago, the Town of Poughkeepsie mandated a cart locking system: stick in a quarter to get a cart, get the quarter back when you return it to the corral. We turn a small profit by returning abandoned carts from the lot, making up for the occasional loss when one won’t disgorge our quarter. 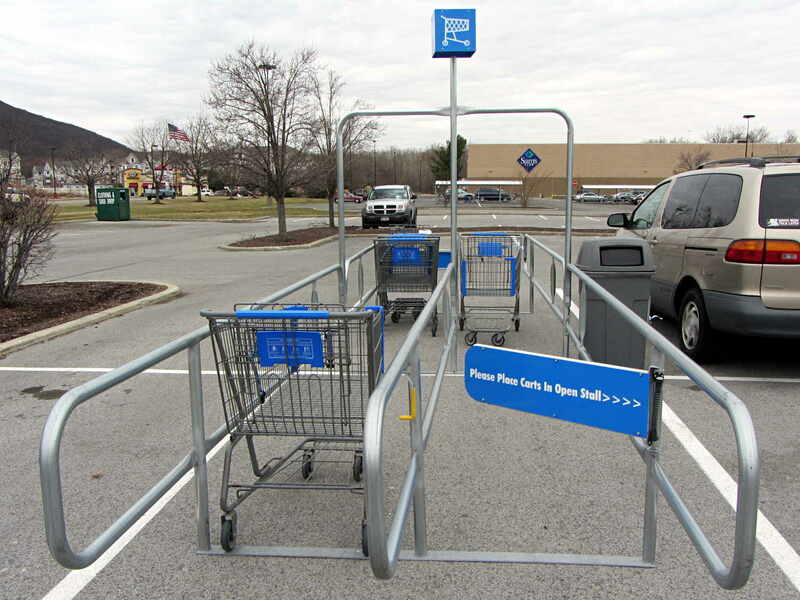 That Walmart is in Fishkill, where carts roam free and most people corral them, anyway. It was amazing to see how many carts ended up in the creek near a San Jose discount supermarket, though it was in a modest-to-good neighborhood. Before that, I lived in a pretty rough section of town, and that discount market fenced off the area just in front of the store so you couldn’t get the cart to the parking lot (and beyond!). Also in the SF area, one brand of mid-range markets did a claim-check system, with people to load your groceries into your car as you pulled up. I don’t think that system lasted. I suspect recovering/losing carts cost less than paying loaders and ticking off customers. They use such a wheel-blocking system at the local Lidl here too.